For more than a decade school library media specialists seeking National Board Certification have sought advice using Yahoo’s library media group. Earlier this month the group’s founder, Cynthia Wilson, announced she would suspend the board due to her retirement. While many rushed to congratulate and thank Cynthia for her service to our profession, several wondered how new candidates could be supported. Could we transfer ownership of the Yahoo group? Could we transfer files? After reading several posts, I suggested that perhaps we should choose another vehicle for the group. Yahoo has served us well, but there have been many advances to social media since the group’s inception. I was thinking that perhaps Edmodo or Collaborize Classroom might be appropriate venues. Then someone suggested Google Hangouts. 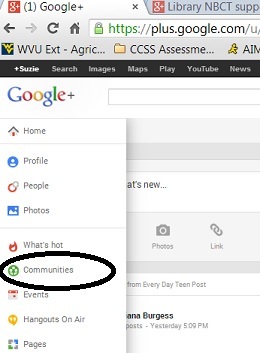 As I was investigating this possibility, I ran across another: Google Communities. I created a mock community for Yahoo members to comment on, and instantly the idea was adopted. Before the community was 24 hours old, it had 17 members and countless files copied and uploaded from the Yahoo site – with Cynthia Wilson’s blessing. Now is the time to let new library NBCT candidates know about our community, Library NBCT Support. In order to join this private community, you must first create a Google+ account. After that, search the Communities forum for our group and request membership. One of the three moderators will respond as soon as possible. My most sincere hope is that we can carry on the great service that Cynthia’s Yahoo group provided so many of the current library media NBCTs. If you are currently certified as an NBCT in library media, please join our community and help our colleagues achieve. As for this blog, I hope to use this space to comment on my professional readings and reflect on how they might relate to the NB process. I hope you’ll come along for the ride.